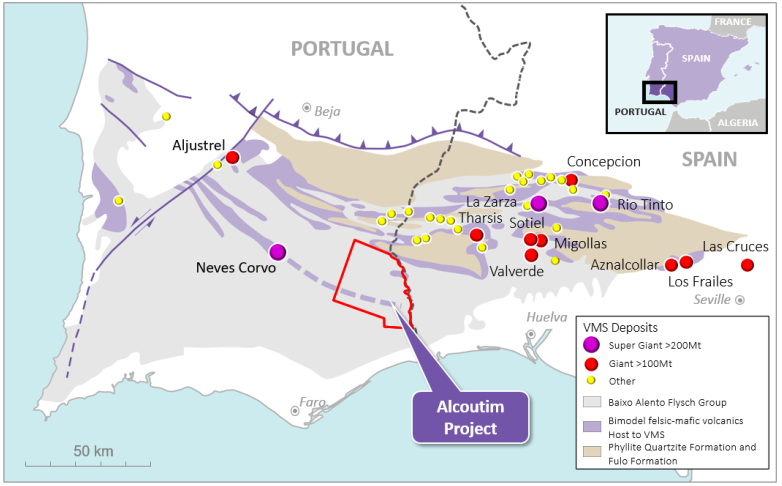 Auroch Minerals (ASX: AOU) announced on Thursday that it had completed diamond drill hole ALFP001 at its base and precious metal Alcoutim project located in Portugal. This is a highly prospective region, as it is immediately along strike from the supergiant Neves Corvo mine which is in the western half of the world famous Iberian Pyrite Belt (IPB). Importantly, AOU is in a strong financial position to complete the upcoming five-hole drilling program with $7.5 million in cash and receivables, and a loan to Bolt Resources, holder of the Alcoutim copper zinc licence. Of course, as with all minerals exploration, success is no guarantee — consider your own personal circumstances before investing and seek professional financial advice. Examining early stage exploration progress as announced today, ALFP001 was drilled to 1,156 metres, and finished in interbedded shales and greywackes of the Mértola Formation Flysch. The hole targeted a magneto telluric (AMT) conductor at a depth of more than 800 metres. The conductor was interpreted to be massive sulphides hosted by a lower order black shale basin, surrounded by mafic magmatic rocks of the Foupana magmatic centre. The Iberian Pyrite Belt is known to host several deposits in similar geological settings, and as such, the identification of these characteristics has buoyed management’s confidence. Exploration drill hole data, along with Euler depth modelling of the magnetic data and several 2D Seismic reflection profiles throughout the licence suggest that the general depth to the top of the targeted Volcano Sedimentary Complex (VSC) varies from 700 metres to about 1000 metres in the vicinity of ALFP001. However, the initial interpretation of drill core suggests the hole drilled into a thicker than expected sequence of flysch sediments, down faulted into the target Volcano Sedimentary Complex (VSC). 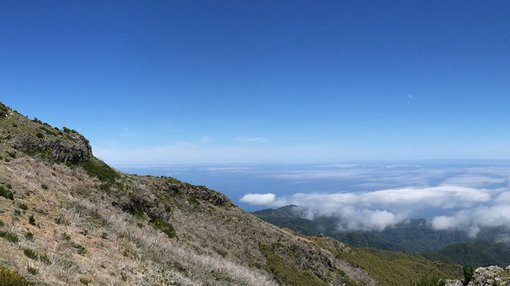 Intense faulting is known throughout the Iberian Pyrite Belt and leads to significant offsets of the target stratigraphy, which can be seen below in the complex faulted nature of the VSC-flysch contact throughout the Neves Corvo mining district. Following the completion of ALFP001, AOU completed a two loop (1,000metres x 1,000metres) Down Hole Transient Electromagnetic (DHTEM) survey in the lower portion of the hole at depths between 736 metres and 1,155 metres. In discussing the data gathered to date, AOU’s Chief Executive, Doctor Andrew Tunks said, “The integration of this down hole EM data with existing data such as magnetics, gravity, and magneto tellurics will be crucial to refining our geological and geophysical models, and best locating our subsequent drill holes”. Tunks is on site with the exploration team helping to shape the geological and geophysical models and plan the next four holes going forward. He anticipates that as each new hole is drilled, additional data will be obtained to help optimize drilling locations. throughout the large Alcoutim license area, with the first five holes to test priority targets along the Neves Corvo Trend. The Foupana magnetic anomaly (42 kilometres south-east of the supergiant Neves Corvo Mine) is the largest and most intense magnetic anomaly of the Neves Corvo Trend which is interpreted to be a large, submarine centre of bimodal magmatic activity. Coincident magneto telluric (AMT) anomalies are interpreted to represent massive sulphide mineralisation. The first two hole locations will test this geological model, close to the magmatic centre and with a strong coincident AMT anomaly. Down hole Transient Electromagnetic (DHTEM) surveys and geochemical assays will be collected from all holes when completed as part of continual refining of target selection. Looking at the bigger picture, AOU is obligated to spend approximately $1.4 million to earn a 65% interest in the Alcoutim project. The company has the right, but not the obligation to earn a further 10% by spending a further $1.25 million.